Much confusion about Buddhist doctrines stems from problems with translation. For example, English translations use the words "mind," "awareness" and "consciousness" to stand in for Asian words that don't mean precisely what the English words mean. One of these Asian words is vijnana (Sanskrit) or vinanna (Pali). Vijnana usually is rendered into English as "consciousness," "awareness," or "knowing." Those words don't mean precisely the same thing in English, and none of them precisely fits vijnana. The Sanskrit word is formed from the root jna, which means "to know." The prefix vi-, indicates a separation or division. Its function is both awareness and cognizance, to notice or observe. Two other words that are commonly translated as "mind" are citta and manas. Citta is sometimes called "heart-mind," because it is a mental state that engages feelings more than thoughts. Manas takes in intellect and judgment. You can see that when translators render all these words as "mind" or "awareness" a lot of meaning is lost. Now, let's look more closely at vijnana. Vijnana is the fifth of the Five Skandhas. The skandhas are collections of components that make up an individual; in brief, they are form, sensations, perception (including recognition and much of what we call cognition), discrimination (including biases and predilections), and vijnana. As a skandha, vijnana usually is translated "consciousness" or "awareness," but there's a little more to it. In this context, vijnana is a reaction that has one of the six faculties as its basis and one of the six corresponding phenomena as its object. For example, aural consciousness—hearing—has the ear as its basis and a sound as its object. Mental consciousness has the mind (manas) as its basis and an idea or thought as its object. The skandha vijnana is the intersection of organ and object. It is pure awareness—for example, your visual system encountering a visible object, creating a "sight." Vijnana does not recognize the object (that's the third skandha) or form opinions about the object (that's the fourth skandha). It's a very specific form of awareness that is not always "awareness" as an English-speaking person understands the word. It includes bodily functions that we don't think of as mental activities. Note also that vijnana is clearly something apart from "mind"—in this case, the Sanskrit word manas, which in a broad sense refers to all mental functions and activities. Vijnana also is the third of the Twelve Links of Dependent Origination. The twelves links are a chain twelve conditions or events that cause beings to come into and pass out of existence (see "Dependent Origination"). Yogacara is a philosophical branch of Mahayana Buddhism that emerged in India in the 4th century C.E. 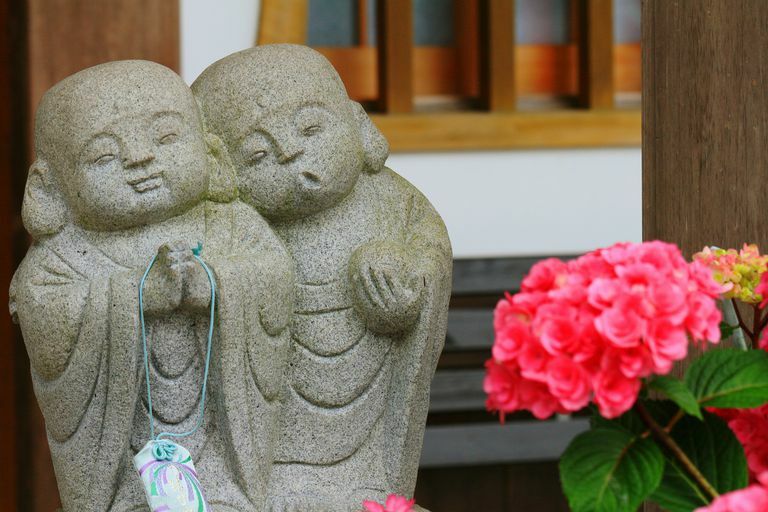 Its influence is still evident today in many schools of Buddhism, including Tibetan, Zen, and Shingon. Yogacara is also known as Vijanavada, or the School of Vijnana. Very simply, yogacara teaches that vijnana is real, but objects of awareness are unreal. What we think of as external objects are creations of consciousness. Yogacara is primarily concerned with the nature of vijnana and the nature of experience. Yogacara scholars proposed eight modes of vijnana. The first six of these correspond to six kinds of vijnana we already have discussed—the interaction between the sense organs - eye, ear, nose, tongue, body, mind—and their corresponding objects. To these six, the yogacara scholars added two more. The seventh vijnana is deluded awareness. This kind of awareness is about self-centered thinking that gives rise to selfish thoughts and arrogance. The eighth consciousness, alaya vijnana, is sometimes called "storehouse consciousness." This vijnana contains all the impressions of previous experiences, which become the seeds of karma. It is also the basic consciousness that generates all the illusory forms we think are "out there." Alaya vijnana plays an important role in how the yogacara school understands rebirth or reincarnation. Since there is no permanent, autonomous self, what is it that is reborn? Yogacara proposes that the experience-impressions and karmic seeds of past lives are passed on via the alaya vijnana, and this is the "rebirth." By thoroughly perceiving the unreality of phenomena, however, we are freed from the cycle of samsara. What Does 'Dependent Origination' Mean to Buddhists?